Don’t be deceived by the apparent simple nature of the yoga exercises that constitute this set. Once you begin to practice this program you will realize its profound benefits to healthy weight loss and much more in a relatively short period of time. The eight yoga exercises that form this set come primarily from the schools of Kundalini Yoga & Hatha Yoga. They, like all yoga poses and movements, work on your being at many different levels. This potent set is designed to not only help you lose weight and burn fat effectively, but, also helps you significantly at an energetic and metabolic level. The breathing exercises done in conjunction with the movements, help expand you lung capacity, improve your circulatory system and raises the internal heat of the body, thus helping it to burn up and eliminate toxins, dead gases and waste products. For safe and healthy weight loss, practice this set daily if possible. Start off doing each exercise for only about 30 seconds or 1 minute each and then build up from there. Use the modifications that are provided if you need to and be sure to pace yourself. If you need to take a short break between the exercises do so, otherwise do them in sequence one after the other without rest. The purpose of this kundalini yoga set, is not only to help you loose the weight, but also to develop a healthy, fit body full of abundant energy. For complicated postures, illustrations have been provided. Also, provided below is the Breath of Fire Breathing Exercise Video, as this kundalini yoga pranayama is extensively used throughout this set. Inhale deeply through the nose as you swing both your arms up with palms facing forward. Now swing the arms down and powerfully exhale through the mouth. The exhalation is brief and powerful. Just throw the air out of the system. Continue at a fairly brisk pace, swinging your arms up and down in this fashion in conjunction with the breathing. Very effective in getting your energy going. Expands your chest cavity and lung capacity. Throws all negativity out of your body (toxins, negative emotions, stress, negative thoughts). Assist this process by visualizing any negativity that has been troubling you being expelled from your system as you exhale. Works on your shoulders, promoting flexibility and strength. d. Practice Tips for Yoga Arm Raises: As you develop mastery over this exercise, try to work through the discomfort in the shoulders this exercises produces. You will notice that after you get past the initial points of resistance, the energy pathways open up and the exercise gets easier. Have your arms in jogging position and begin marching in place. Begin the Breath of Fire Breathing Exercise. Try to bring your keens up high as you march. Gets your heart rate going. Effective warm-up before doing the more strenuous exercises. d. Practice Tips for Kundalini Yoga March: To modify this exercise switch to Long Deep Breathing or Normal Breathing if Breath of Fire is too much to do. You can also not bring the knees up too high and walk in place instead. Continue to have your arms as if you were jogging, also continue the Breath of Fire Breathing Exercise, and start jogging in place. Try to bring your keens up high as you jog. Picks up your heart rate and really gets the blood circulating throughout your body. Done with Breath of Fire the benefits of this exercise are significantly magnified. Doing a few minutes with Breath of Fire is equal to doing the exercise much much longer with normal breathing. d. Practice Tips for Kundalini Yoga Jogging: To modify this exercise switch to normal breathing, if Breath of Fire is too much to do. You can also not bring the knees up too high or just continue to walk/march in place instead, if you feel over worked. Stand with your arms down and feet together. Now take a half inhalation and jump your legs to about shoulder width apart and swing your arms straight out to the sides parallel to the ground. The palms are facing down finger are extended. Now complete the inhalation as you jump and bring your feet wide apart. At the same time swing your arms directly above your head and clap your palms together. Now do a half exhalation as you jump your feet back to shoulder width apart and swing your hands back to being parallel to the ground with palms facing down and fingers extended. Now complete the Jumping Jack by jumping your feet back together and bringing your hands back down all the away. Continue on for the duration of the exercise. Good for your heart and lungs. Works on building concentration and focus. Works on your calves and leg muscles. Works on your arms and shoulders. d. Practice Tips for Kundalini Yoga Jumping Jacks: This yoga exercise is not as easy as it sounds initially as you have to focus in order to break the pattern of how you normally do Jumping Jacks. The partitioned breathing will help build your lung capacity. To modify just do the legs or just the arms as needed. Extend both arms straight out in front of you, with fingers extended and palms facing down. Inhale through the nose as you squat down. Exhale powerfully through the mouth as you stand back up. Continue at a smooth pace for the duration of the exercise. Excellent for toning and strengthening the large muscles of you thighs and buttocks. d. Practice Tips for Deep Squats Yoga Exercise : If you have bad knees you need to careful with this exercise. Only go as far down as you are comfortable. Stand and place your feet wide apart. Now have your left foot pointing to your left, have you right foot pointing in slightly, the heels of both feet should be in a straight line. Your torso should be straight and facing forward. Low lean to the left so that 70% of your weight is on your left leg. Your left knee should occlude your left foot from view if you were to look down. There should be a stretch in your right upper thigh. Now extend your left arm out to the left as if holding a bow and turn your head to the left and gaze over your left fist. Now with the right hand pretend as if you are pulling back the bow strings. Your right hand should be all the way past your right chest. 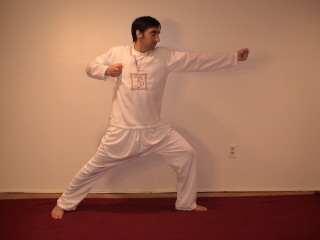 Do Long Deep Powerful Breathing while holding this posture and gazing steadily over your left fist. After half the time reverse the direction of the posture. 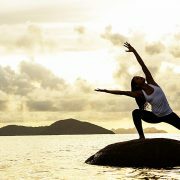 Excellent yoga posture for your entire body, mind and spirit. Opens up and expands your energy channels. Builds strength of character, self-esteem, confidence, concentration and mental focus. Expands your chest and lungs. Also, works on your nervous system. Good for your legs and shoulders as well. d. Practice Tips for Kundalini Yoga Archer’s Pose : This yoga asana (posture) is the favorite of many students and teachers alike. It will make you powerful and strong. Don’t over do it if you already have ego issues. Lie on your back, bend your legs and bring you knees in towards your chest. Hold on to each knee. Right hand grasps right knee, and left hand grasps left knee. If you are doing this right, pretty soon your abdominal muscles will let you know. Very good for building your core power and abdominal strength. Good for building overall fitness and stamina. d. Practice Tips for Kundalini Yoga Abdominal Pop Corn Exercise: Another yoga exercise that you should not be quickly fooled by. If doing it correctly it is a great way to burn calories and develop strong abdominal muscles without putting any strain on the joints and lower back. Make sure you are using a soft surface when doing this exercise. Sit Comfortably with your legs crossed. Use a firm cushion if you need to. Now move everything from the hips up vigorously and chaotically. You should be moving your arms, shoulders, chest, waist, fingers, head, etc. Breath very deeply and powerfully during the entire duration of the exercise. You navel should be pumping due to the force of the breathing as well. Don’t hold back let everything fly. Charges, invigorates and awaken all your cells and organs. Excellent for throwing out all the garbage of the past and breaking down deep rooted patterns of thought and behavior. Detoxifies your system and builds your ability to handle more energy. d. Practice Tips for Kundalini Yoga Dance & Shake : If you are listening to music, turn it up during this exercise. It is the last physical exercise for this set so give it all you have got. Lie on your back and have your arms out to your sides about six to twelve inches away from your body. Turn your palms slightly upward. Relax your body and breath. With every breath visualize your body as you would ideally want it to be. Visualize it taking that shape and visualize yourself having optimum health and fitness. Visualize the weight melting away. Don’t underestimate the power of your mind. Really believe this to be taking place, especially because is it. b. Duration for Yoga Corpse Pose: 1-5 minutes. Attracts that which you set your mind to (in this case, a healthy, fit, toned, slim body). Allows the body to consolidate the gains from the previous exercises. Helps the body heal and rejuvenate itself. d. Practice Tips for Yoga Corpse Pose: If your mind wonders, don’t judge or criticize yourself, just gently return back to the visualization process. You have done your part, now let the Universe do Hers. This concludes the Online Yoga Exercises for Healthy Weight Loss Program. wow, thank you so much, that was hands down the best and most fun home yoga routine i have ever done. wonderful. thanks again!